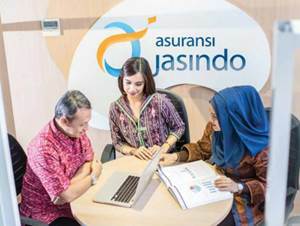 PT Asuransi Jasa Indonesia (Persero) - Asuransi Jasindo or referred to as "JASINDO"is a well-known state-owned general insurance in Indonesia company headquartered in Jakarta. JASINDO offers a wide range of general insurance products. Its products are categorized into 9 lines of business; Cargo, Property, Aviation, Engineering, Marine Hull, Motor Insurance, Various, Financial Insurance and Oil & Gas Insurance. JASINDO is a non listed state-owned company and is fully-owned by the Government of Indonesia which represented by the Minister of State-Owned Enterprises (SOE). JASINDO was established in 1972 as a merger results of PT Asuransi Bendasraya and PT Umum Internasional Underwriters (UIU). As of December 2016, JASINDO runs its business through 48 branch offices, and 40 sales offices spread across Indonesia. According to information found in PT Asuransi Jasa Indonesia (Persero) Annual Report 2016 as cited by JobsCDC.com, JASINDO posted an increase of 7.43% in total gross premium from Rp 4,845.07 billion in 2015 to Rp 5,205.19 billion in 2016. Reinsurance premiums amounted to Rp 2,897.72 billion in 2016. This number is up 3.48% over reinsurance premiums recorded in 2015 of Rp 2,800.58 billion. JASINDO registered total comprehensive income of Rp 385.07 billion in 2016 or grew by 2.53.6% as compared with Rp 375.54 billion in 2015. Strong communication skill, polite and honest. Able to work mobile and familiar with target. Preferably for those who have experience as marketing in loss insurance and banking industry. Preferably have driving skill (possess SIM A and or SIM C). JobsCDC.com now available on android device. Download now on Google Play here. Please be aware of recruitment fraud. The entire stage of this selection process is free of charge. PT Asuransi Jasa Indonesia (Persero) - Business Banking Development Agent JASINDO August 2018 will never ask for fees or upfront payments for any purposes during the recruitment process such as transportation and accommodation.